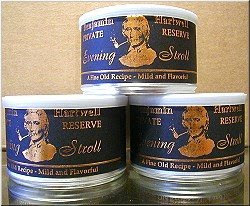 The following is a review I did of Benjamin Hartwell's Evening Stroll on 02/21/2006. Mild and Flavorful - Benjamin Hartwell's friend, Jim Murdoch, was a real dandy, always dressed in the most fashionable styles of his day. He preferred his pipe tobaccos mild and with a hint of sweetness to please the women as he walked by. Ben made his blend for Jim and called it Evening Stroll. Evening Stroll or better yet Evening Desert. This is a fruity vanilla aromatic blend...perhaps a hint of maple mid-bowl. The tin aroma is a little strong in the vanilla and burns much the same but leaves a pleasant room note for my wife...but I don't smoke for my wife's benefit =). I don't know what I think of this weed. Its hard reviewing sometimes because all the tobacco I have are all quality smokes, including this can. Without any comparisons to what I enjoy smoking and on its own merits for what it is...its good but I think the flavoring is a little too high for me to have it around, even as a goto candy treat. I will polish this can off and leave it at that.